Vancouver is an amazing city, chock full of creative talent. WE ARE VANCVR is a simple, elegant way to showcase all that talent in one place. Every week we profile one individual from the VANCVR community.VANCVR.com is a Domain7 Labs project. Last week, we published an open letter to TEDxVANCOUVER with a modest proposal. We are huge TEDx fans, and we’re also huge fans of all the bright ideas generated by our city’s creative types. That’s why the team at Domain7 Labs started We Are VANCVR in the first place—to bring all this talent together for good and then see what emerges. When TEDx returns for its third installment in Vancouver on November 12, we would love to see some of that talent on stage. This is the first of five letters we’ll be posting to TEDx, with speaker recommendations from the We Are VANCVR community. Meet Kara Pecknold. She’s a specialist in human-centred design and spends lots of time developing tools for design research in other cultures. Several years ago, as a Master of Applied Arts and Design student at Emily Carr, she was tasked with creating a website for a small business in Rwanda. “My work in Rwanda exposed flaws in how we develop design briefs in a cross-cultural environment—without shared language or assumed technology,” she explains. Though her job was to create a website for a group of women who create and sell woven goods, her “clients” had no electricity and no distribution model. 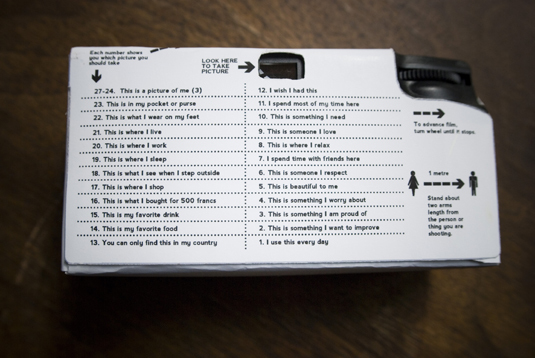 She partnered with the women to collect data about how they perceive their actual needs. Because they don’t share a common language, she sent the women out with disposable cameras, note pads and pens to gather visual insights that would lead to something adaptable and usable in their context. Her research revealed a need far more relevant than a website: a way to distinguish the cooperative from thousands of other weaving groups in the region. Together they co-designed a logo mark that helps these women stand out at trade shows around the country. To avoid the high cost of printing, Kara had the logo turned into a rubber stamp. She kept it low-tech—no electricity required—to ensure it is a truly useful tool. Pretty cool, no? The result wasn’t just a functional asset for this rural African business, but a fresh, human approach to design research. Her findings have since been included in IDEO’s Human-Centred Design Toolkit, supported by the Gates Foundation. “The project opened up tons of opportunities to talk about design as conduit for social impact,” she says. Now she’s working at the national level in Rwanda, to develop packaging for a micro-nutrient that mothers can add to the food they feed their infants (a bit like the fortified pablum we all had as babies). When she’s not travelling the world advocating and implementing design for social change, Kara teaches on the topic at Emily Carr—challenging designers and businesspeople alike to make their do-good efforts sustainable. She also consults on design research at various Vancouver agencies (at the moment she’s working with the awesome team at Dossier) and was a driving force behind the hugely successful Dinner with a Side of Design at last year’s Design Week. There are so many reasons why we think Kara would be a fantastic presenter at the next TEDxVancouver, but not the least of these is that she’s an incredibly eloquent and compelling individual. She knows her stuff, but she also knows how to make other people care about sustainable design, and well, we think that’s pretty impressive.